I have been given an opportunity unlike any other in my more than 30 years of creating advertising and marketing communications. Literally, we have been working as one on both sides of the Atlantic, building a brand from the ground up. I was invited a bit late to the party as the product name, logo and color palette had already been decided upon and an e-commerce website was already in the works. Still, there was a lot more to be done and I was thrilled at the opportunity to be able to help. What we’ve done over the past few months has been fun to see it all evolve. There is still a lot of work to do. And this is a long, interesting story to tell. So rather than condense it all into one blog post, I’m going to spread it out a bit. 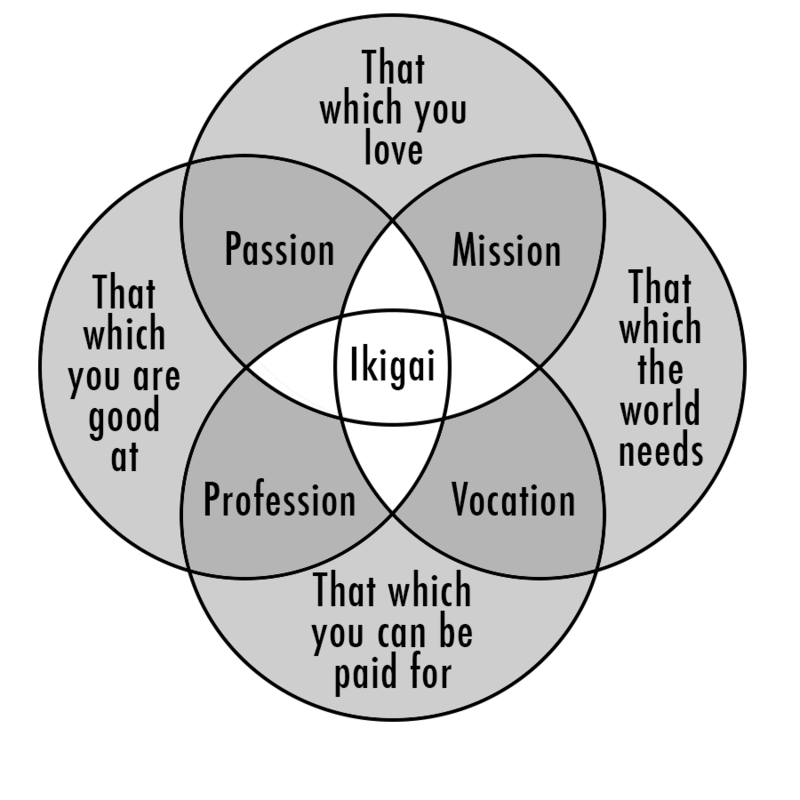 I’ll begin with the product name – Ikigai. It’s a Japanese term that essentially means your reason for being – what gets you up in the morning. So how did a new line of camera bags decide to call themselves Ikigai? One of the founding members new of the expression and thought it would be a great name for a company that featured three entrepreneurs who were all looking to follow their own passion of creating a company from scratch and doing it a bit differently than the competition. Turns out, the name Ikigai was even more appropriate than they initially imagined. When in Rome, do as the Romans do. And when in Crete, do as the Cretans do. So that’s exactly what Chris and I did on our recent journey to the island of Crete, the largest of the Greek islands that was the birthplace of Zeus and home to many fishing villages and idyllic settings that make you think you’re a part of some exotic photo shoot that will end up in a Conde Nast Traveler magazine. Basically, the trip was a reward for Chris because she’s a member of one of the top performing independent insurance agencies in the country for Safeco. It was called the Chairman’s Awards and it was an honor for her to be recognized and a thrill for me to get to accompany her as one of the few spouses that happened to be on the male side of the equation. But the true highlight of the entire trip is the subject of this post. All the attendees of the event were asked to wear all white on Sunday night for our second excursion into another fishing village. Little did we know that we were all dressing up to be the honored guests of a faux Greek wedding ceremony and festive reception. And little did we know that there would also be a Greek Orthodox priest on-hand so couples could renew their vows. Whether he was real or not is still up for debate, but Chris and I went through the ceremony and yes, it was all Greek to me. Just about the time that most couples had renewed their vows, a boat arrived with an official wedding party in tow. The bride and groom entered, followed by the best man, and then the bride’s immediate family as well as the groom’s. There was even the elder grandma who was not happy with the whole affair, feeling her granddaughter had married below the family’s high standards. And yes, there was some heft in the family as well with two of the female relatives tipping the scales probably well over the 250 mark – maybe more – making it a true, big, fat, Greek wedding. Yes, they were all character actors but they played the part well and we were all willing recipients, enjoying the food and drink, accompanied by many toasts to the newly wed couple. 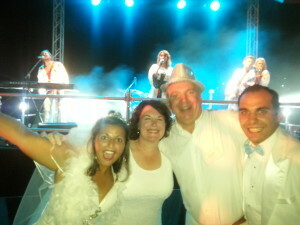 The party was rocking and everyone was in a festive mood when we were informed that the band was ready to perform. All eyes shifted to a group that was still in the dark on a stage that couldn’t have been more than ten feet away from where we’d been out dancing minutes before. I saw there were two females with their backs turned to us, wearing what looked like the boxing robes that Rocky wore when he took on Apollo Creed. Suddenly, the lights of the stage turned on and the band kicked in singing a familiar song by Abba – a group that got its claim to fame back in the 70s. Could it really be them? They sure sounded like it. Was it them? I had no idea. Mama Mia, here I go again. They were incredible. I was convinced it was them. Somehow, they had climbed into a time capsule and had been perfectly preserved. I kept thinking they’ve got to be at least as old as I am if not older – but there they were, singing Dancing Queen, Take A Chance On Me and Money, Money, Money. It was surreal. It was a sing-along. It was a blast. And when they finished with Thank You For the Music, I was convinced I really had seen Abba as they left the stage and party music kicked back in. My investigations tonight revealed that just like the character actors in the wedding party, Abba was also just an illusion. Looking back on it now, the whole evening was hard to fathom. There we were on the island of Crete, far, far away from our normal everyday routines. It was all surreal. It was a trip. Three days removed from the island of Crete, it’s back to reality. As usual, my apologies to the few followers that I actually have. My blogging has dropped off the face of the earth. I blame it all on my time management skills and a BloodLines Creative workload that has been heavier than I’ve probably ever had in my career. The dangerous thing about working from home is that your office is always just a few steps away. And I’ve been spending a lot of time in it over the past few months. I have been blessed to have an abundance of work – and it’s been challenging, fun, great work at that! Three different accounts have provided a variety of opportunities for me to display my skills as a writer, a producer, a marketing and brand strategist, a Social Media planner and contributor, a project manager and given me the opportunity to work with a wide range of extremely gifted individuals not just here in the states, but across the pond in London, as well. Most mornings I’ve been clocking in before 7 am and clocking out … well, I never really clock out. I’m excited about the work I’ve been doing, energized by the people I’m working with and I look forward to sharing some of that work in the near future once it’s out there for the world to see. In the meantime, I have a backlog of blog posts that I hope to begin pushing out starting late next week on a more regular basis. Soon I’ll also be putting the finishing touches on a new painting I started last week which will be the first in a series where I’m fascinated by the possibilities and the simplicity of the sketches I’ve done before taking them to canvas. So thanks for reading and I plan on firing up my creative blog juices to get this thing rolling again. As I said in the title, great news is just around the corner.